Kumortuli (also spelt Kumartuli, or the archaic spelling Coomartolly) is a traditional potters’ quarter in northern Kolkata (previously known as Calcutta), the capital of the east Indian state of West Bengal. The city is famous as a sculpting hot-spot which not only manufactures clay idols for various festivals but also regularly exports them. The British colonisation of Bengal and India started following the victory of the British East India Company in the Battle of Plassey in 1757. The Company decided to build new settlement Fort William at the site of the Gobindapur village. Most of the existing population shifted to Sutanuti. While such neighbourhoods as Jorasanko and Pathuriaghata became the centres of the local rich, there were other areas that were developed simultaneously. The villages of Gobindapur, Sutanuti and Kalikata developed to give rise to the latter day metropolis of Calcutta. Holwell, under orders from the Directors of the British East India Company, allotted ‘separate districts to the Company’s workmen.’ These neighbourhoods in the heart of the Indian quarters acquired the work-related names – Suriparah (the place of wine sellers), Collotollah (the place of oil men), Chuttarparah (the place of carpenters), Aheeritollah (cowherd's quarters), Coomartolly (potters’ quarters) and so on. Most of the artisans living in the north Kolkata neighbourhoods dwindled in numbers or even vanished, as they were pushed out of the area in the late nineteenth century by the invasion from Burrabazar. In addition, Marwari businessmen virtually flushed out others from many north Kolkata localities. The potters of Kumortuli, who fashioned the clay from the river beside their home into pots to be sold at Sutanuti Bazar (later Burrabazar), managed to survive in the area. Gradually they took to making the images of gods and goddesses, worshipped in large numbers in the mansions all around and later at community pujas in the city and beyond. In 1888, one of the 25 newly organized police section houses was located in Kumartuli. Kumortuli is located in Ward No. 9 of Kolkata Municipal Corporation, mostly between Rabindra Sarani (formerly Chitpur Road) and the Hooghly River. It is between Ahiritola and Shobhabazar. 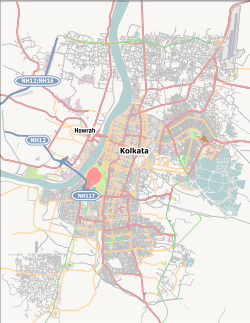 In maps showing thanas or police stations in old Kolkata, Kumortuli is shown as being between Shyampukur, Bartala, Jorasanko, Jorabagan and Hooghly River. Dhakeswari Mata Temple is a Hindu temple located in Kumortuli, Near Sovabazar, Kolkata. Situated in eastern bank of hooghly river near Kumartolly area. The presiding deity of the temple is Devi Durga, which was taken to Kolkata in 1947 from Dhakeswari Temple in Dhaka, Bangladesh. The idol is 1.5 feet tall, has ten arms, mounted on her lion in the form of Katyani Mahishasurmardini Durga. On her two sides are Laxmi, Saraswati, Kartik and Ganesh. And the mount, lion, is Mythological Lion. There are rumours surrounding the origin of this temple. It is believed that the wife of King Bijoy Sen once went to the village of Langolbond to bathe. On her way back she gave birth to a son, Ballal Sen. Later this Prince became King of the Sena destiny. After ascending to the throne, Ballal Sen built a temple to glorify his birthplace, which is known as Dhakeswari temple, Bangladesh. Ballal Sen proceeded to have vivid dreams, one of which involved the deity Durga. He dreamt that Durga was hidden within the jungle; he then discovered the deity who was concealed there. In order to celebrate this discovery, he built a temple later named Dhakeswari. This explains the etymological meaning of "Dhakeswari", which means "covered or hidden deity". According to Bengali Hindus Dhakeswari is considered to be the presiding deity of Dhaka, which is an incarnation or form of Goddess Durga, the Adi Shakti. The idol of Durga is called Dhakeswari. In 1947, during the Partition of India, priests of the temple decided to evacuate the idol from Dhaka to kolkata due to security reasons. After this, a Tiwari family from Azamgarh was appointed by the royal family to undertake daily worship of the deity. In 1946, the descendants of that family, Prallad Kishore Tiwari (or Rajendra Kishore Tiwari) transported the idol in a highly confidential aircraft to Kolkata and was re-appointed, where they still serve the Goddess continuously. After taken to Kolkata, the idol spent the next 2 or 3 years worshipping in the Debendranath Chowdhury home. In 1950 the businessman Debendranath Chowdhary built the temple of Goddess in the Kumortuli area and established some of the Goddess' property for her daily services. The Dhakeshwari devi worship is different from the traditional Durga puja of Bengal. According to the current priest of the temple, Shaktiprasad Ghosal, during Durga Puja, the goddess is worshiped in accordance with the Navratri or nine night rituals of Northern India. Being in the periphery of the heart of Kolkata, Kumortuli was home to a number of renowned persons during the Bengal Renaissance. There is a road in Kumortuli named after Nandram Sen, famous as Black Deputy, and the first collector of Kolkata in 1700. Gobindram Mitter, the next Black Deputy, had a sprawling house at Kumortuli spread on 50 bighas (around 16 acres) of land. Banamali Sarkar's famous house which is immortalized in Bengali rhyming proverb, was there till the 19th century. He has a winding lane named after him in Kumortuli. Idol of Devi Durga is under preparation. ^ Cotton, H.E.A., Calcutta Old and New, 1909/1980, p. 72, General Printers and Publishers Pvt. Ltd.
^ Map on p. 16, Calcutta, the Living City, Vol I. ^ a b c d e f "কলকাতার কড়চা". anandabazar.com. Retrieved 3 October 2018. ^ Daniyal, Shoaib. "Bangladesh's most important Hindu temple has been witness to a tumultuous past". Scroll.in. Retrieved 3 October 2018. ^ "TEMPLE AND A CITY". The Daily Star. 22 April 2016. Retrieved 3 October 2018. ^ "ঢাকেশ্বরী মন্দির, ঢাকা - আদার ব্যাপারী". আদার ব্যাপারী. 28 September 2016. Retrieved 3 October 2018. ^ "ঢাকেশ্বরী মন্দির - বাংলাপিডিয়া". bn.banglapedia.org (in Bengali). Retrieved 3 October 2018. ^ "Dhakeshwari Temple, Dhaka". Places of Peace and Power. Retrieved 3 November 2018. ^ Deb, Chitra, The Great Houses of Old Calcutta in Calcutta, the Living City, Vol I.
Wikimedia Commons has media related to Kumortuli.